When you have problems with your teeth, it can cause a range of issues for you. You will find that in some cases, it could be more difficult to eat or even talk because of issues with your teeth. In addition, you have to think about how it can make you more self-conscious, as well. Many people who have cracked or missing teeth, or other issues, do not want to smile. It can hamper their social life. Fortunately, restorative dentistry provides a number of options that could help. What Can Restorative Dentistry Help? You will find that this field can help people who are dealing with different types of problems with their teeth. Procedures are available that can help those who have missing teeth, as well as those who have cracked, chipped, and broken teeth. The restorative dentists can help those who have damaged or deteriorating tissue, infected gums, and more. No matter what type of problem you might be facing with your teeth, get in touch with our restorative dentists to see how we can help. A range of options are available today. You could get dentures if you are missing some of your teeth. Of course, you might also want to see if you are a good candidate for dental implants. Other options for restorative dentistry include dental crowns, bridges and fillings. We can help you find a restorative dentistry option that could help you. 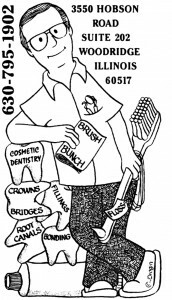 You will want to get in touch with one of our dentists in Woodridge at Machnowski, DDS today. We can provide you with the help you need when it comes to restoring your smile and your health. You can get in touch with us on the web through our contact page. You could also call us at 630-795-1902 if you prefer.